“Death Before Dishonour” is the ancient Bashido code of the Samurai, and a code that designer Chris Manning takes very seriously. Enough to name his entire brand after it! In his own words, “To vow Death Before Dishonour is to swear to live life by the principles one believes in and to make no excuses for oneself”. Now try and tell me that that isn’t inspirational. And it’s this inspiration that Chris has poured into his brand ‘Death Before Dishonour‘ to create a hard hitting collection of seven in your face designs, printed onto high quality tees. And I should know, because I have one proudly in my wardrobe! The seven tees are limited to 100 copies of each, making them sought after items. I’m not sure if the 7 tees / 7 Samurai link is deliberate, but I like it anyway. It’s all about attention to detail. 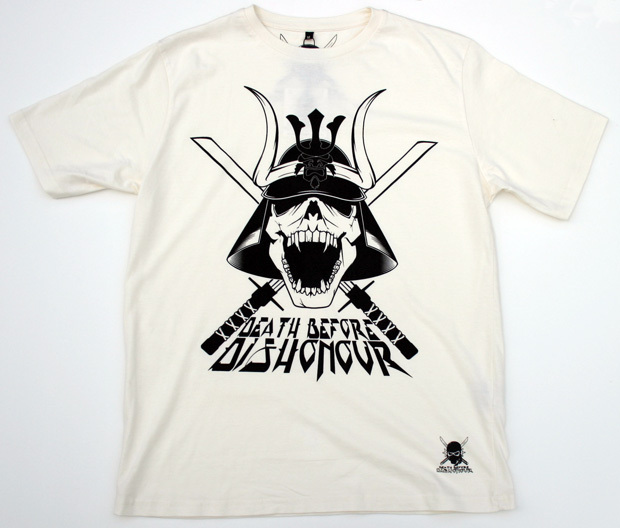 All of the tees are available now through the Death Before Dishonour website.